Is Trump Fueling Republicans’ Concerns About NATO, Or Echoing Them? This week, at the NATO summit in Brussels, now-President Trump sparred with the NATO secretary general and demanded that other member countries more than double their defense spending (they ultimately agreed only to continue to try to reach the existing financial targets). Trump was echoing the sentiments of the 25 percent of U.S. adults who, according to a YouGov poll conducted this week, hold an unfavorable view of NATO. That includes 15 percent who see the alliance “somewhat” unfavorably and 10 percent who see it “very” unfavorably. By contrast, 24 percent of Americans give NATO somewhat favorable ratings, and 20 percent give it very favorable ratings, for a total favorability score of 44 percent. Like so much else these days, NATO has become a partisan issue. Democrats told YouGov that they view NATO favorably by an overwhelming 55-point margin (64 percent to 9 percent), but among Republicans, unfavorable opinions of NATO win out by an 8-point margin: 45 percent to 37 percent. Among Trump voters, 54 percent view NATO unfavorably, while just 33 percent view it favorably. Republicans have long been more skeptical of multilateralism and international organizations than Democrats; that’s reflected in the large gap between the opinions of Democrats and Republicans on the United Nations. Partisans’ views on NATO may also shift around in response to specific events. For example, according to the Pew Research Center, Republican support for NATO fell sharply in 2013, a year after the attack on U.S. government buildings in Benghazi, Libya. Republicans’ anger at the Obama administration over Benghazi may have spilled over into animosity for NATO, through which the U.S. first intervened in Libya in 2011. And Democratic support for NATO shot up in 2017, after several months of news reports and punditry about Russian interference in the U.S. presidential election to assist GOP candidate Trump. Republicans who continue to think poorly of NATO may not just be following Trump’s cue. 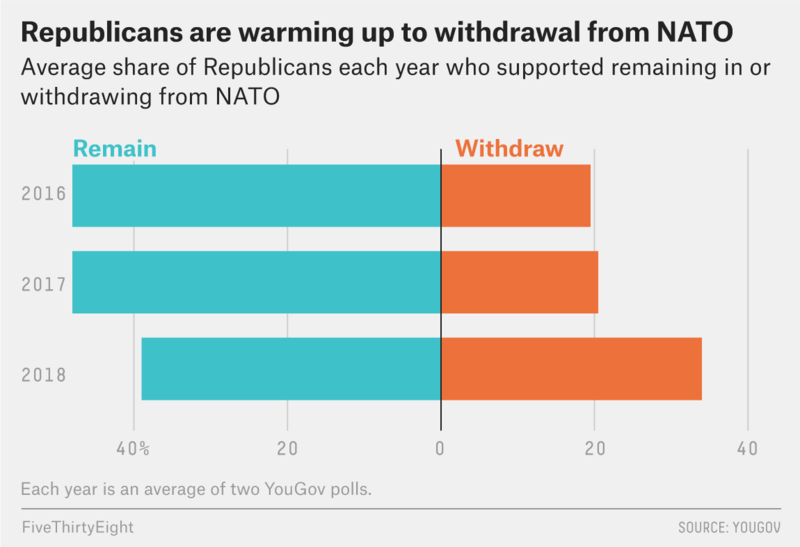 Indeed, previous polling suggests the opposite: Trump may be the one responding to an existing undercurrent of discontent over NATO among Republicans. YouGov has asked Americans about their feelings on NATO since before the 2016 election. In March 2016, 40 percent of Republicans had unfavorable views of NATO, compared with 38 percent who had favorable views. Among Democrats, 49 percent had favorable views, while only 15 percent had unfavorable ones. Likewise, Pew consistently found in surveys from 2009 to 2017 that more Democrats than Republicans held favorable views of NATO. But while Republicans’ overall attitude toward NATO hasn’t changed, perhaps Trump is inspiring them to finally want to do something about it. Since 2016, YouGov has also asked American adults whether it’s time for the U.S. to withdraw from NATO or remain in the alliance. And over the past two years, there has been an uptick in the share of Republicans who support withdrawal. In March 2016, Republicans wanted to remain in NATO 48 percent to 17 percent. But in this week’s YouGov poll, Republicans were deadlocked on the question, 38 percent to 38 percent. At one point in U.S. history, almost no one thought poorly of NATO. The earliest poll we could find testing NATO’s popularity was a National Opinion Research Center survey from 1956, seven years after NATO’s founding. That year, 82 percent of respondents said NATO was a good idea, compared with just 8 percent who said it was a bad one. For the nation’s bicentennial in 1976, the Roper Organization asked whether the U.S. did the right thing in helping form and joining NATO; 55 percent said it was the right thing, and just 9 percent said it was the wrong thing.1 Support began to slip in the 1990s: In 1994, 60 percent of Americans said NATO should be maintained, while 27 percent said it was no longer necessary. Support for NATO has hovered in that general range ever since (with a brief spike in support amid NATO’s bombing campaign in Yugoslavia in 1999). The U.S. isn’t the only country where NATO is a political football. Two of Germany’s major populist parties, Alternative for Germany on the right and The Left on, well, the left, are generally anti-NATO, and Jeremy Corbyn, leader of the U.K.’s Labour Party, once said that the organization should be disbanded. In fact, the U.S. was right around the median country in terms of overall NATO support, according to a 2017 Pew survey of the U.S. and 11 other NATO member countries. It found the alliance’s net favorability rating (total favorable rating minus total unfavorable rating) in the U.S. to be quite close to what it was in the U.K. and Germany. Poland was the most pro-NATO country, while Turkey was the most skeptical. According to a Rasmussen Reports poll, 83 percent of likely voters think the Senate is likely to confirm Brett Kavanaugh to the Supreme Court, while 44 percent believe the federal appeals court judge, whose nomination was announced by Trump on Monday, should be confirmed. Democrats oppose the nomination (63 percent to 16 percent) more than they opposed the nomination of Neil Gorsuch, Trump’s first Supreme Court pick, in a Rasmussen poll conducted in the week after Gorsuch was nominated (48 percent to 32 percent). Two polls about ice cream are in agreement that Americans’ favorite flavor is chocolate, followed by vanilla and butter pecan. Butter pecan was most popular among the oldest age group in both surveys. We, however, are hip with the youths who prefer cookies and cream. The Trump administration said it will reverse a policy put in place by the Obama administration that encouraged colleges to consider race as a factor in admissions to diversify student bodies. Seventy-one percent of registered voters said universities should not consider race when determining which applicants to admit, according to a Morning Consult poll. That might make affirmative action seem really unpopular, but, reader, beware! Polling around affirmative action can vary based on how a question is asked. For example, Gallup found in 2014 that 58 percent of Americans reported being in favor of “affirmative action programs for racial minorities,” but 67 percent favored college admissions based solely on merit (without consideration of someone’s race or ethnicity). According to a Pew Research Center survey about activism and social media, 80 percent of black Americans said social media highlights issues that might not otherwise get a lot of attention; 62 percent of white Americans agreed. Conversely, 80 percent of white Americans said social media distracts people from issues “that are truly important,” while 66 percent of black Americans agreed. 42 percent of Americans report being better off financially than they were two years ago, according to an Emerson College poll. President Trump tweeted about the poll, saying that “most Americans, especially Hispanics, feel that they are better off under President Trump than they were under President Obama.” In an article, the Boston Globe noted that the president’s facts “weren’t quite right.” The survey question specifically asked if people were better off financially (which Trump failed to note), the question did not make any mention of Obama, and it was a plurality, not a majority, of voters who said they were better off now than two years ago. Sixty-two percent of Hispanics did, however, report being better off financially. A YouGov poll found that 73 percent of Republicans want Trump to run for re-election in 2020. That’s up since August of last year, when 65 percent wanted him to run. 71 percent of Americans say they make an effort to buy products that are made in the U.S., according to a poll by SSRS. According to a Gallup poll, Americans have varying opinions on the trade policies that other nations have with the United States. Sixty-five percent say Canada’s trade policy is fair, 56 percent say the European Union’s is fair, and 30 percent say China’s is fair. 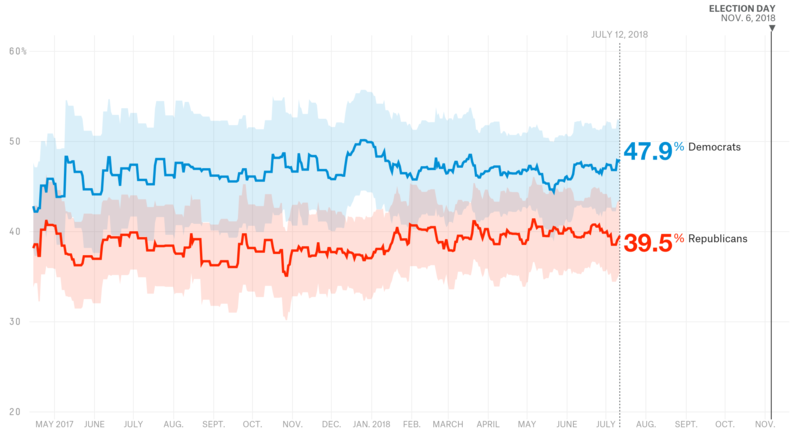 According to our model, Trump’s approval rating is 42.3 percent, and his disapproval rating is 52.7 percent, for a net approval rating of -10.4 percentage points. 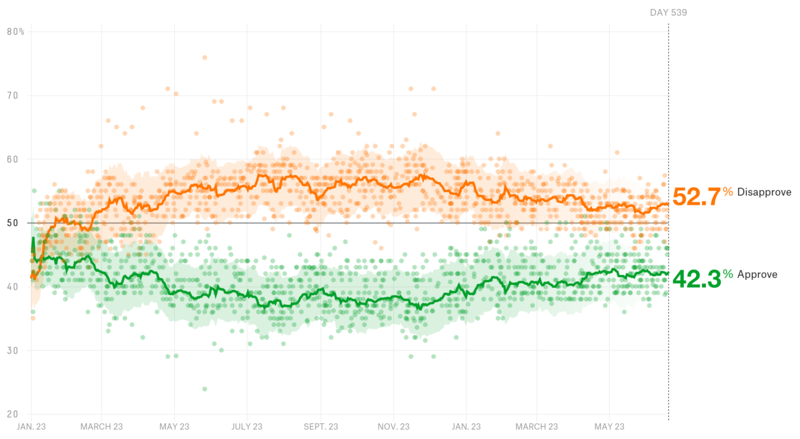 That’s similar to his -10.7-point net approval rating from one week ago, when his approval rating was 42.2 percent and his disapproval rating was 52.9 percent. It’s also not too different from his -11.1-point net approval from this time last month. On June 13, his approval rating was 41.4 percent, and his disapproval rating was at 52.5 percent. Democrats currently lead the race for Congress 47.9 percent to 39.5 percent, according to our tracker. That’s an advantage of 8.4 percentage points. This time last week, Democrats were ahead by 8.3 points. One month ago today, Democrats held a 7.8-point advantage. The remaining respondents either said it was somewhere in between (15 percent) or didn’t know (21 percent).